Designed for use with many brands of gas stoves. Tundra pots and pans have milled bases so they won’t slide off the stove. Non-stick surface for easy cleaning. 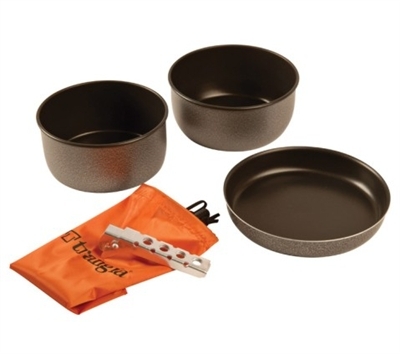 Includes 1.75 L and 1.5 L pots, 8″ frypan, pot gripper and carry bag. Set nests together into a compact 8″ x 3.75″ size. Wt: 1.2 lbs.